We all deserve to pamper ourselves every once in while. Unfortunately things like spa treatments and facials can cost a hefty amount of $$$. But still the importance of having a couple minutes of indulgence is important. Recently I began looking into cheap spa treatments I can do in the comfort of my own home. The way I looked at it was its a win-win, I spend less money and get all the benefits of a day at the spa. I heard through a friend about this great product line called Seacret: minerals from the dead sea, which uses all natural ingredients to help hydrate your skin. I have tried a few products in a small seminar that helped me know which products to use to help certain problem areas on my skin. The three products I used were the Mud Soap, Mineral-Rich Clarifying Mud Mask, and the Mineral-Rich Body Mud Mask. The Mud Soap can be used daily and Clarifying Mud Mask which can be used bi-weekly. I started out with applying the mud to the upper half of my body, reaching from my waist to my jaw line. And for my face I used the Clarifying Mud Mask. 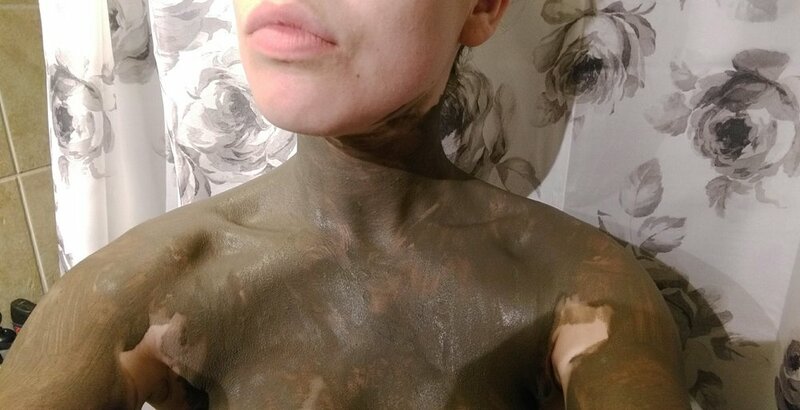 I applied the mud and left it on for about 15 minutes and when the mud turned from a dark green to a light green colour, I washed off the (now) dried mud off with warm water. The result, smooth skin and in total I spent $150 with more leftover for multiple uses. I was thoroughly impressed and not to mention my wallet was thoroughly relieved. Do You Need A New Skin Regimen? Everyone is different, especially our skin! And finding the perfect skin regimen can be near impossible! Like most teenagers, I had awful acne in high school. I tried every skin care product advertised or recommended to me, and nothing worked. Proactive, Skin ID, and even random products that I’ve never heard of such as Seacret: Minerals from the Dead Sea. All seemed to work for a while, but nothing was the solution. That was six years ago! Recently I visited Dermalogica (a great skin care brand), and got my face sectioned off into 14 zones, something they call being Face Mapped. It was a great one-on-one consultation, and I learned that the skin products I was currently using were actually damaging my skin (NOT GOOD!) As the dermatologist talked about each zone in detail, she recommended 4 products specific to my skin type. Because my current skin regime was damaging I decided to try the Skin Health product line. Under this product line there are specific treatments depending on your skin type. I am oily/normal skin so I replaced my old skin care products with ones more specific to my needs. Using a gel to clean your face will keep more moisture locked in than if you were to use soap. The cleansing gel is soap-free that thoroughly remove impurities without disturbing the skin’s natural moisture balance. Before my one-on-one consultation I never knew how important it was to exfoliate your skin! This product is a rice-based exfoliating powder that acts as a scrub upon contact with water. The micro-exfoliate takes away dead cells, leaving your skin smoother and brighter. Because I do have oily skin and trouble zones with dehydration, I use an oil-free active moisturizer. The product is lightweight and easy to apply, it helps improve skin texture and combat overall surface dehydration. Typically this product is suited for skin with excess oil production. This is another product suitable for all skin types. This eye cream has an SPF of 15 that helps conceal dark circles and reduce the appearance of puffiness and fine lines. The products recommended did wonders on my face even after only one use! The overall feeling and appearance of my skin has brightened and smoothened over the course of one night! The final product I purchased was to diminish my oily skin while I am wearing makeup. Ladies if this sounds like you, listen up! I have always had excess oils on my skin and over the course of the day those oils were apparent on my face. This skin Primer is to be applied as a base to your makeup to give yourself a clean, photo ready face. The primer smooth’s away fine lines while brightening and priming for flawless skin. Most skin care products are general to whether you have oily, dry, or normal skin. However, because of the one-on-one consultation I was able to get an expert opinion on specific zones, each recommendation was catered to the troubled zone, not my overall face. If you’re unsure if your current skin regimen is the right one for you, or you’re just looking for an expert opinion, Dermalogica is hosting free Face Mapping events all over Canada from now until June! Check out FaceMapNation.com and see the next location closest to you!